Times out of number boxing has been described as the hardest game of all: a tired cliché perhaps, but certainly one that rings true. In my experience – albeit from outside the ropes – the noble art is also apt to provide more drama and intrigue, more excitement and thrills, and yet more frustration and heartbreak than any sport around. No athlete trains harder than a top-class boxer. None puts himself through greater pain or at greater risk for our entertainment. Lethal fighting machines with the grace of ballerinas, improbable twists and turns, superhuman feats of endurance and bravery beyond reason… you'll find it all in the roped-off square, where the seemingly impossible becomes a reality. Sadly but undeniably the sport of boxing is in decline. Today Britain has only a few hundred active pro boxers who, with a few exceptions, fight just a handful of times each year. With such a paucity of action competitive matches are harder to come by, and even the fights that do produce 'the goods' seldom receive the media coverage they deserve. In days gone by, however, the fistic landscape was different. Prior to World War 2 Britain had thousands of pro boxers, men who fought week-in and week-out at venues nationwide. Boxing was then a sport of the masses, akin to professional football in Britain today. Our leading boxers were national idols, the lesser-known ones local heroes, and boxing made the newspaper headlines without fail, every edition. So boxing has an important place in Britain's heritage. It is our aim – through this blog and our forthcoming website – to honour that heritage and the men who helped to create it. We will examine both the sport and its underlying social influences. Just what drove men to punch for pay and why was boxing so popular? Boxinghistory.org.uk is our forthcoming website. Along with this blog, it will be the first port of call for anyone wanting to know more about Britain's boxing past. On it you'll find a wealth of information, previously unpublished fight records and rare photos. As soon as the website goes live we'll make an announcement via this blog, so make sure you bookmark us (press 'Ctrl' and 'D' on your keyboard) and check back often. There's plenty of exciting British boxing history heading your way! 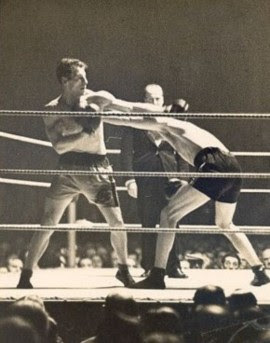 Welcome to the boxinghistory.org.uk blog: the best online resource for articles and unknown facts on Britain's boxing past. This blog has been launched in tandem with boxinghistory.org.uk, an exciting new website dedicated to the history of boxing in the United Kingdom. On this blog you'll find unique stories of forgotten fighting men, articles on venues that have long faded from living memory, astounding facts and figures, plus the inside story of boxing in your area. Be sure to check back regularly and bookmark us by pressing 'Ctrl' and 'D' on your keyboard. Born to Box is a book that explores the life and ring career of Nipper Pat Daly, arguably boxing’s greatest ever prodigy. A pro at age 10, by 14 he was beating grown men and at 16 ranked in the world’s top ten. But tragically he was overworked and forced to retire by 17. Told by the author and by Nipper himself via his previously unpublished memoirs, it is a story like no other. Fighting Men of London is a book that explores the lives of seven former professional boxers who fought in the capital between the 1930s and 1960s. Set around a series of interviews, it resurrects a golden age of the sport when boxing was as popular as football and Britain's leading fighters were working-class heroes.
. Picture Window theme. Powered by Blogger.